“Pursuant to the winding-up order of the Supreme Court of Bermuda dated 14th July 2017, Keiran Hutchison and Roy Bailey of EY Bermuda Ltd were appointed as joint provisional liquidators of Cumulus,” the BMA said. [i] Section 14[a] IFA – Failure to prepare annual audited financial statements for the past five years. [ii] Section 6 to 8 of the Fund Rules 2007 – Failure to prepare audited financial statements for the years ending 31st December 2012, 2014, 2015 and 2016. The company has provided audited financial statements for the year ended 31st December 2013, which statements are highly qualified and have not yet been signed off by the company or the auditors. [iii] Section 3[a] and section 14[b] of the IFA – failure to comply with the requirement to have an investment manager with day-to-day control over the management of the property of the company. 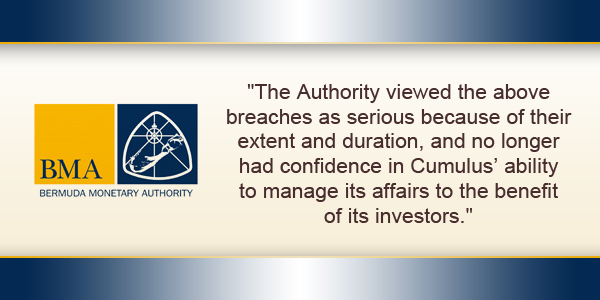 “The Authority viewed the above breaches as serious because of their extent and duration, and no longer had confidence in Cumulus’ ability to manage its affairs to the benefit of its investors. “The Authority’s actions highlight the importance of its role in protecting the reputation of the jurisdiction and protecting the interests of investors. Wasnt the BIU behind 11 years not that long ago? Two Bermudas. Dont get me wrong this company should be shut down. However same rules should apply to all.